At the beginning of 2016 over 500 shale wells were operative, making this community one of the areas in the world most affected by fracking, outside the USA. Significant deposits of shale oil and gas were discovered in Neuquén province in the Loma de Lata field in 2010, adding to Argentina's overall shale reserves which are estimated to be the second largest technically recoverable reserves in the world. The country ranks fourth in the same category for shale oil. Argentina’s Vaca Muerta shale formation, also in Neuquén, is estimated to hold an amount of oil and gas nearly equal to the reserves of the world’s largest oil company, Exxon Mobil. The country has over 150 shale wells in production, more than any country in the world aside from the U.S. and China (4) Argentina has claimed all oil and gas fields as government land but exploration and exploitation permits and the final product are in control of the provinces and extraction companies. Argentina's environmental protection regulatory frameworks have been criticized for being weak, with one key area for concern fresh water use and waste. Another concern regarding fracking is its potential to contribute to earthquakes in a part of Argentina experiencing increasing volcanic activity (4). On June 15th, 2013 Chevron signed an agreement with the newly state-controlled YPF (formally controlled by Spain’s Repsol) in Argentina to begin resource extraction anew in the region of Neuquén (3). The pilot stage of the project involves 1.24 billion invested for 161 wells drilled in a 20 sq km area. The second phase of the extraction project would involve 1500 more wells in a 395 sq km region. Chevron and YPF hope that 50,000 barrels of oil and 3 million cubic meters of associated natural gas could be produced daily from the project (1). The Vaca Muerta region might contain as much as 23 billion barrels of oil, according to a YPF-released report (6). There has been a court-ordered probe into suspected irregularities in the YPF-Chevron agreement. A court in May 2014 began to investigate President Cristina Fernandez, who is accused of abusing her authority regarding the YPF-Chevron agreement. While a lower court had dismissed the charges, a federal appellate court in Buenos Aires overruled this decision. Fernandez was accused of ‘abuse of authority, breach of public duty and potential environmental damage’ (1). The YPF-Chevron agreement makes the company Argentina’s largest foreign producer of natural gas and shale oil (6). 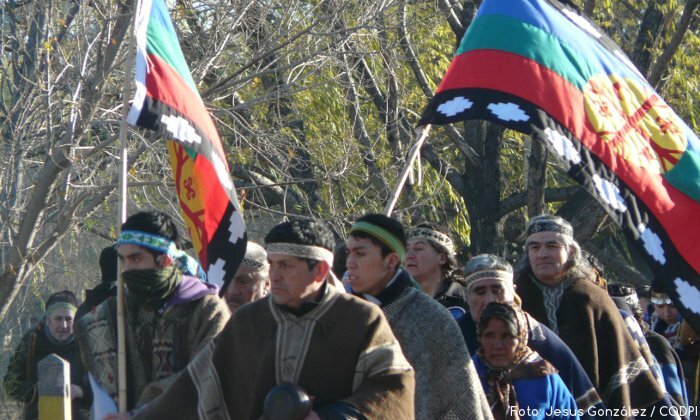 The YPF-Chevron project is set to take place in Mapuche territory, though the Mapuche people claim that throughout the entire process there has been no consultation and their demands are not being heard. (X; 3) Of particular concern is the risk to Auca Mahuida natural protection area, a ceremonial and spiritual site. 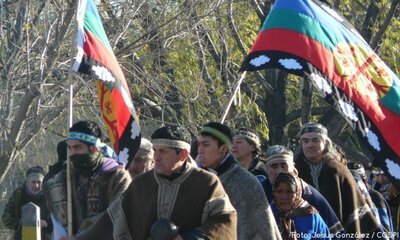 (X) Elías Maripán, lonko (authority) of the Mapuche Confederation of Neuquén, stated that the Mapuche would continue to defend Wallmapu, their ancentral territory, for thousands of years to come. Jorge Nahuel, lonko of the Newen Mapu community, stated that the extractive industry threatens the cycle of life (3). Extraction activities carried out when YPF was still associated with Repsol in the Loma de la Lata region in Neuquén have already caused major negative environmental impacts, including contamination of water, land and atmosphere, along with chronic heavy metal poisoning in dozens of people. 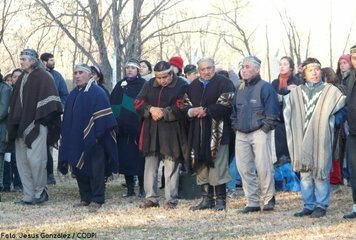 The activities have also increased social conflict and repression against Mapuche authorities (3). Since Chevron’s agreement with YPF to begin extraction in Vaca Muerta, Neuquén, the lonko of Maripe Purran have denounced the arrival of company trucks in their territory as well as the rise in repression and aggression towards local activists (3). A manifesto signed by the Mapuche Confederation of Neuquén laments, “One of the most contaminating companies of the continent has arrived in our territory. This same company in Ecuador devastated the territory of the Kofán and Siona people” (translated from Spanish). Representatives from indigenous groups affected by Chevron’s activities in Ecuador have visited Neuquén to warn the Mapuche of the dangers to indigenous territories that the company poses (3). 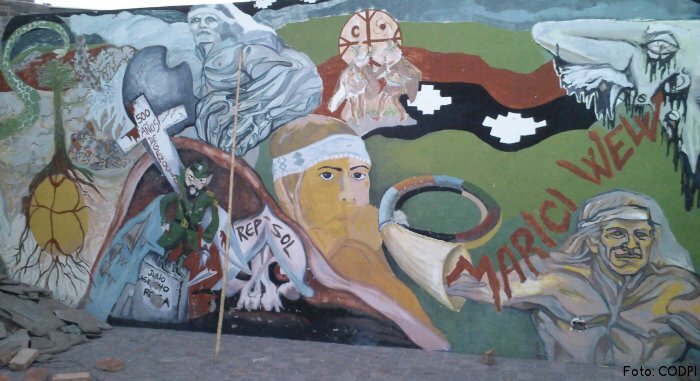 On August 28th 2014, a mobilization against the project was met with heavy police repression. Within 7 hours more than 25 people had sustained injuries from tear gas and rubber bullets, and police detained several people. Shortly after, 10,000+ people marched in the streets against the YPF-Chevron agreement and the repression being faced by local activists. In the next two days four Campo Maripe Mapuche houses were burnt to the ground in retaliation for the resistance. Mapuche people and local organizations occupied mining pits to hold those involved in the attack responsible (2). The Argentinian organization Obervatorio Petrolero Sur (OPSur) has called to alert the international community of the situation, warning that the Chevron agreement is just the tip of the iceberg (2). Update 2016 (in Spanish): Ante la falta de diálogo y la ausencia de un proceso de consulta, hacia finales de 2013 la comunidad comenzó a emplear acciones de fuerza. Tras la toma de las primeras torres, se inició una estrategia conjunta con otras comunidades, que incluyó cortes de ruta, movilizaciones y tomas de tranqueras. El conflicto es cada vez más grande, debido a que mes a mes aumenta la ocupación territorial con la construcción de nuevos pozos. La realización de una mesa de diálogo permitió que la comunidad pudiera comprobar su ocupación "tradicional y pública" del territorio. Así lo señala un informe realizado a petición de la comunidad y el gobierno provincial. Este indica que desde la década de 1920 “hay permanencia probada en cada década a través de documentos escritos, las marcas en su territorio y en el relato y la memoria de sus integrantes”. El informe agrega que se ha podido documentar cabalmente los límites de la ocupación actual de la comunidad, y que el reconocimiento de su existencia tiene “un claro carácter de reparación histórica”. Hacia inicios de 2016 más de 500 pozos de shale estaban operativos, convirtiendo a la comunidad en la zona más afectada por el fracking en todo el mundo, por fuera de EEUU. La urgencia por aumentar los niveles de extracción ha significado también un aumento de los accidentes, que cada cierto tiempo llenan las páginas de los diarios y vuelven a poner en la discusión pública el riesgo de los impactos de explotación no convencional. El Lonko (lider) de la comunidad, Albino Campo lo sintetiza en una frase: “donde hay un pozo hay un derrame. Acá pasa lo mismo que pasó en Loma La Lata, en la comunidad Kaxipayiñ. Uno escarbaba 80 cm y no llegaba al agua, era gasolina que brotaba. Acá pasa lo mismo, lo que cae de arriba se filtra y llega al río. De ser tierra de producción, después no va a servir nada”. Project Details -Área de 395 Km2 cuyos limites se superponen con el territorio de la comunidad indigena mapuche Campo Maripe. Company Names or State Enterprises Yacimientos Petroliferos Fiscales (YPF Argentina) from Argentina - partner with Chevron Corp.
Development of Alternatives Mapuche authorities and local organizations are asking for proper consultation regarding resource extraction projects in accordance with the International Labour Organization Indigenous and Tribal Peoples Convention (ILO 169), ratified by Argentina in 2000. Currently, Argentina is violating this convention. Why? Explain briefly. Though resistance is ongoing, the damages already done to the environment and lives of the Mapuche people and other inhabitants of Neuquén are severe. International Labour Organization Indigenous and Tribal Peoples Convention (Convention 169) Article 6 (1a) "governments shall consult the peoples concerned, througha ppropriate procedures and in particular through their representative institutions, whenever consideration is being given to legislative or administrative measures which may affect them directly". 4. Fracking Frenzy: How the Fracking Industry is Threatening the Planet? A report on fracking in the global south.